Check out our list of top considerations for planning your relocation. Meet with space planners and key personnel to discuss the needs of the new office space as soon as possible. 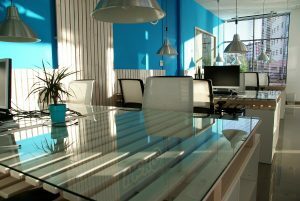 This is a critical time to discuss what your needs are for the new office space. Think about any changes you would like to see from the current building to the new one, as well as how to accommodate your employees at the new location. Consider any expansion needs that will allow for future growth; may it be an addition onto an existing building or more electrical wiring to accommodate more workers in the future. It’s pertinent to discuss this with a space planner. Determine improvements that are needed. If adding on, for example, it’s more than likely that you’ll need allowance for improvement from the builder. Make sure that the builder or developer will provide the electrical plans for the new space. This is critical because in office relocation, moving IT systems and networks are big components of the move, and they need to be up and running immediately at the new location. Consider taxes and insurance, as well as distance from current suppliers, current and potential customers, and the company’s employees.